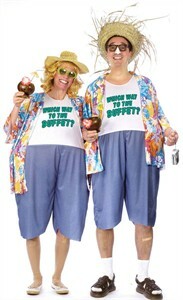 In this Tacky Tourist Costume, you'll turn into every vacationer's worst nightmare! Our one-piece jumpsuit includes a hoop waist, baggy shorts, a T-shirt with a funny screen print ("Which way to the Buffet? "), and a tacky Hawaiian overshirt. Slip into this hilarious traveler costume and head out for an evening of buffet-hopping that's sure to get you noticed! Wear as a couple's costume for some extra fun. One size fits most. Package includes 1 costume. Availability:This Tacky Tourist Costume generally takes approximately 1 business day to leave the warehouse plus transit time.